The holes in the bucket drained the water from the holding tanks while the trout were transferred into the big bambi bucket. Once the bucket filled with trout, the long tether line was straightened out for liftoff. 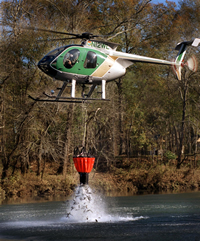 The pilot would slowly lift, after having cleared the trees he took off up the river with each full bucket of trout. On this particular day, he made 10 trips up the Chattooga River. To see all that’s involved you would think it would take all day explains an article in the Raburn Georgia TU newsletter. But once the ship got started, the experience and expertise of the crew on the ground had thousands of trout swimming in the Chattooga River in just a few hours. To say what I watched was impressive would be an understatement. Each time you fish the Chattooga DH, remember the work and man hours that go into stocking the river. The South Carolina side did the same thing one week before Georgia. Different agencies participate and contribute funds to make this happen every year. For those who support Rabun TU we spend a portion of our funds to help make this event possible.